Update 19.03.2015: Now Payment against room charges can be made online using Credit Card / Debit Card / Internet banking instead of cumbersome procedure of sending Demand Draft to booking agency. 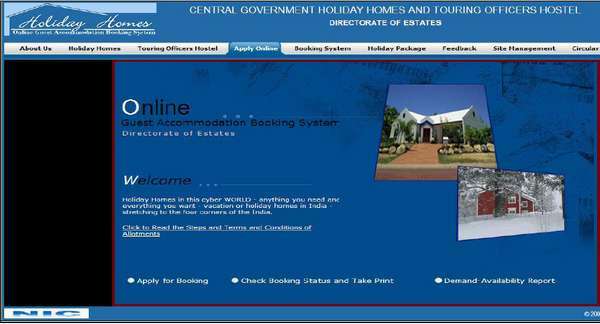 Now, Directorate of Estates has launched a new online reservation system for booking Central Government Holiday Homes. This system is found to be very user friendly. The earlier online system was slightly cumbersome since it required additional installation of software such as Java run time environment to be installed in the user computer. We provide here a summary of this how to guide. These are important links in the vertical menu we find in the first screen. available for maximum of 90 days from the current date. Select the Guest Accommodation, Booking Agency and Period for which you want to check the demand – availability and press ‘Report’ Button. 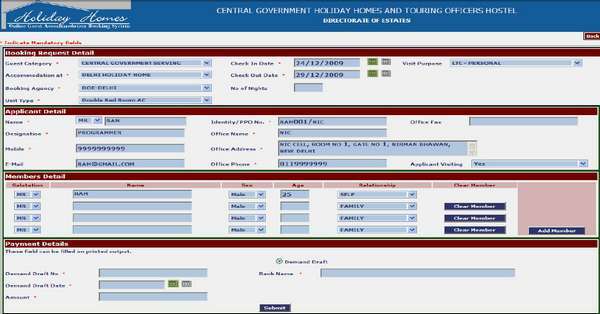 Booking Request From Date and Booking Request From To dates are to be specified since these are mandatory columns. Calendar for these dates are active for the allowed range of 90 days from the current date, for the period you can check the status. 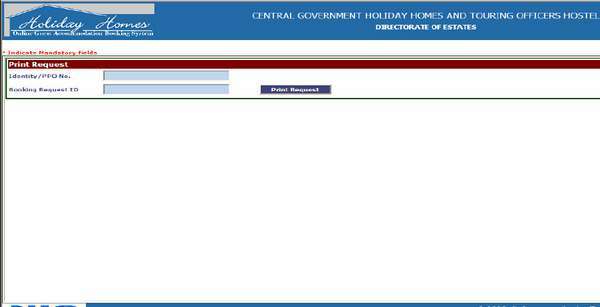 If you have intended to look for availability at Mussoorie Central Government Holiday home for a given date and booking agency you get the following screen. After you have ensured using check availability option that you have got a vacant room in a Holiday home you wish to stay, click apply online link from the starting (initial) screen. To Book a room online, select “Apply for Booking” button, which would take you to the following screen after you click the formal “I agree” button. Red marked fields are mandatory. Though there are four sections provided to the user under this screen but only 2 are visible by default and once you completely fills the two shown on screen two more will appear. Booking Request Detail: You will have to select in the order of ‘Guest Category’, ‘Accommodation At’, ‘Booking Agency’, and ‘Unit Type’ then the fields ‘Check In Date’, ‘Check Out Date’ and ‘No. of Nights’ will become active. You have to select Check In and Check Out Date using the calendar attached and can clear the dates using the button for clearing dates, attached next to calendar. 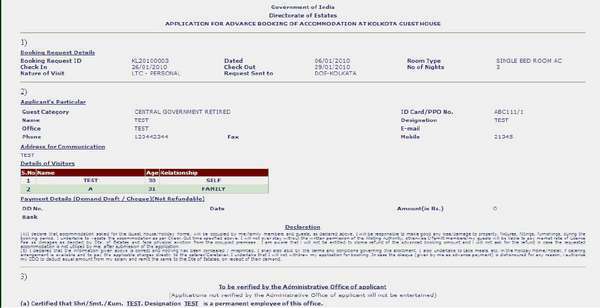 Applicant Detail section will be enabled after all the fields of Booking Request Detail section has been filled up. Applicant Detail: This section is for entering the Name, Designation, Mobile No., Email Address, Identity/PPO No. ( Identity card no. in case of serving and PPO no. in case of retired persons), Office Name, Office Address, Office Phone, Office Fax, Grade Pay. Then you have to select whether Applicant will also be visiting at Guest Accommodation or not, under the field ‘Applicant Visiting’. If the applicant is not visiting, identity details of any of the members visiting will have to be provided in the fields which appear when we select “no” for “Applicant visiting”. Payment Details: After the completion of the entire above blocks ‘Payment Detail Block’ will be activated. This block is optional, you can fill the details under this block if have the details of demand draft, otherwise you can leave this block entirely empty. In case you decided to fill this block then all the fields in this block are to be filled. If you are yet take Demand draft leave this block empty yet system would reserve room for you. The details of Demand draft can be filled up manually in the reservation printout which you would be taking at the end for sending the same to the booking agency selected for booking. You have to take the print out of the application form and get an authentication from your AO and submit it to the Booking Agency along with requisite payment. From the apply online screen select “Check status” radio button. Then provide the booking request Id and your identity card number used for booking. Click here to get complete details of these holiday homes and Touring Officer’s hostel. check here for other terms and conditions.